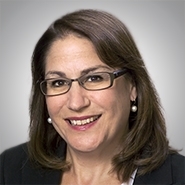 Sarah Edelman Coyne is the national chairwoman of Quarles & Brady LLP's health law group. She represents and advises health care providers and health plans on a variety of issues, including regulatory compliance and patient care issues. A: 25 percent luck, 25 percent hard work, 25 percent brains, and 25 percent personality. The "luck" part was that I joined the firm at a time when there were few associates, and none in health care, and I was able to integrate myself into a thriving health law practice that had been built by my predecessor and one of my mentors, Michael Weiden. The "hard work" included missing a lot of time at home with my babies and working a lot of nights and weekends. As for the brains, I am very grateful to my parents for the excellent genes but I really cannot take credit beyond that. But the real key is the over-used but absolutely legitimate concept of relationships. I have the personality to be a health care lawyer and a health care group leader — I connect with clients, and I connect with my team.